The European Lead Factory was established to promote the discovery of novel small molecule candidates, suitable for subsequent optimization either to drug candidates or to high‐quality pharmacological tools for the experimental validation of targets. Firstly a public compound collection, built from donations from Pharma partners but also synthesis of novel compounds, the aim is for a collection of 500,000 molecules. The second facility provides ultrahigh throughput screening capabilities, together with cloud-based informatics tools for analysis and filtering. For academic or small companies this is an interesting way to access a high-throughput screen, full details of the rewards and obligations if a project is accepted are detailed online. There are some animations that describe the process in more details here. I've now been involved in a number of projects that have made use of the ELF and I'm pretty happy with the results. Set up in 2013 it has already accepted 42 targets for screening, submitted by publicly funded researchers, and generated 12 Qualified Hit Lists. 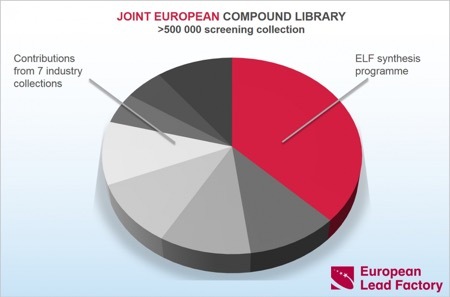 It has just been announced that the Joint European Compound Library (JECL) has now reached the target of 500,000 compounds. So far, >180,000 novel compounds have been synthesised and the five library production partners Edelris, Mercachem, Sygnature, Syncom and Taros are well under way to deliver another ~20,000 compounds before the end of the project. Only compounds meeting JECL quality criteria for purity (LC–MS purity >85%, average 97%) and quantity (>5 μmol, average 15 µmol) are added to JECL.